Most folks who visit Carson City never notice the sculptures arranged in the plaza between the State Capitol and the State Legislative Building. But that handful of bronzes spotlights several of the most significant people in Nevada’s past. The three larger-than-life statues in the plaza depict a trio of 19th century historical figures including Abraham Curry, Adolph Sutro and Kit Carson. 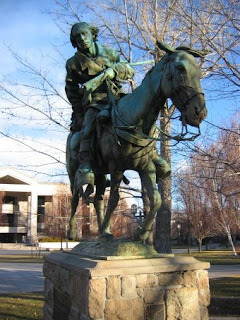 The oldest of the works, dedicated in 1979, is the figure of Curry, the man considered the father of Carson City. It presents Curry, casually dressed in a shirt, pants and shoes, holding a rolled up blueprint that represents the plans for the city. 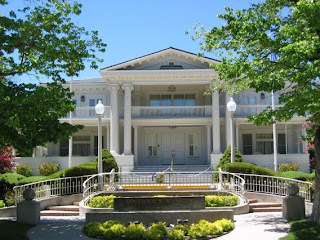 The Nevada Association of Realtors, which donated the statue to the state of Nevada, had it created to honor the man who laid out Carson City, donated the land for the state capital and built many of the city’s most prominent buildings, including the U.S. Mint and the V & T Railroad maintenance shops (now gone). Nearby is a statue that is generally said to depict Adolph Sutro, the man who engineered and constructed Sutro Tunnel. The four-mile tunnel, which took nine years to build, is considered one of the major engineering achievements of the 19th century. Sutro Tunnel, which stretched from near Dayton to beneath the Comstock mines, drained hot, sulfurous waters that made working underground so dangerous. Crafted by Nevada sculptor Greg Melton, the work is officially called “Tribute to Nevada Miners” and depicts a bearded miner, based on Sutro, who stands holding a pick-axe over his head with both hands. He wears boots, pants and a shirt with rolled-up sleeves. The third bronze on the plaza commemorates explorer and scout Christopher “Kit”Carson, an American scout and frontiersman who led the John C. Frémont Expedition in 1843-44 through the territory that became known as Nevada. This work shows Carson in his buckskin garb riding a horse. In his glove right hand, he holds a hat while his gloved left hand grips a rifle and the horse’s reins. He is slightly bent over the horse as if looking for signs of a trail. The statue, which is more than 8-feet-high, stands on a base inscribed with a plaque and two maps of Nevada showing the trails blazed by Carson. The inscription on the Carson statue indicates: “1843-44, Kit Carson by Buckeye Blake, Commissioned by Truett and Eula Loftin.” The Loftins, former owners of the Ormsby House Casino in Carson City, donated the work to the state of Nevada in 1989. The creator of the work, artist Buckeye Blake, was born in California but lived in Carson City as a boy during the late 1950s. He currently lives in Texas, where he maintains his studio. Not all of Carson City’s statuary stands in the plaza, however. The most recent bronze is a representation of Native American author (she was the first Native American woman to write a book) and activist Sarah Winnemucca Hopkins, which was placed inside the State Capitol in 2005. This elegant bronze, which measures more than six-feet tall, shows Winnemucca with a shell-flower—her Paiute name is “Thocmentony” or Shell Flower—in one hand and a book in the other. She is garbed in traditional, fringed buckskin clothing and leather boots. The statue, created by South Dakota sculptor Benjamin Victor, is a duplicate of one that stands in the United States Capitol, National Statuary Hall in Washington D.C. It was donated to the hall by the Nevada Women's History Project in 2005. Nevadans have long disdained pomp and circumstance. This trait was particularly evident during the state’s first four decades, when lawmakers refused to provide funding to erect a home for the elected governors. As a result, from 1864 to 1909, each of the state’s governors either built his own dwelling in Carson City or rented quarters. While many of these “unofficial” governor’s mansions were quite nice—such as the one built on Mountain Street by Governor Reinhold Sadler, a wealthy businessman and rancher, who served from 1896-1903—the state did not have a formal “people’s house” for governors to live and entertain guests. Finally, in 1907 State Assembly Bill 10, known as the “Mansion Bill” was passed by the Legislature. It directed the state to secure a site and build a permanent residence for Nevada’s governors and their families. The lawmakers appropriated $40,000 for building and furnishing the home. Mrs. T.B. Rickey, who lived nearby, sold a site at 600 N. Mountain Street to the state for a token amount of $10 and Reno architect George A. Ferris (not related to G.W.G. Ferris, the man who invented the Ferris Wheel, who grew up on Carson City) was hired to design the house. Ferris also designed the McKinley Park School in Reno and the former Civic Auditorium in Carson City (now home of the Children’s Museum of Northern Nevada). The architect developed plans for a two-story, 23-room home with a large grand entry area, a formal dining room, a pair of salons, a private den, upstairs bedrooms and a large kitchen area. A porch supported by fluted Ionic columns wraps around the second story. The home’s exterior incorporated what historians describe as a Classical Revival style with Georgian and Jeffersonian motifs. After soliciting bids, the state awarded a $22,700 contract to build the mansion. Construction began in 1908 and continued until early 1909. The first chief executive to occupy the house was Acting Governor Denver S. Dickerson and his family. His wife, Una, gave birth to a daughter, June, in the mansion on September 2, 1909; she is the only child ever born in the mansion. Governor Dickerson opened the mansion to the public for the first time on New Year’s Day, 1910—a precursor to the present tradition of opening the mansion to the public each Nevada Day. The mansion has hosted 17 governors and their families since it opened. During the past century, the mansion has been renovated several times including a partial refurbishing in 1959, a more substantial remodeling in 1967 and a $5 million reconstruction in 1999-2000, which was funded by private donations. During that $5 million remodeling, which was privately funded, a 6,608-square-foot addition was built north of the mansion, called the Nevada Room, with a commercial kitchen and meeting space for up to 300 people. For more information about the mansion, pick up a copy of “State of Nevada: The Historical Governor's Mansion," produced in 2003 by former First Lady Dema Guinn. Beautiful photos of the mansion’s interior and exterior, by Minden photographer Jay Aldrich, enhance text written by Robert Nylen, curator of history at the Nevada State Museum, and Guy Louis Rocha, the former Nevada State Archivist, who, respectively, describe the history of the mansion and the story behind the Nevada Day celebration. Additionally, the book contains brief histories and portraits of every Nevada Governor and First Lady (up until former Governor Kenny Guinn). Copies of the booklet can be purchased at the Nevada Legislative gift shop (http://www.leg.state.nv.us/giftshop/). Not much remains of the 19th century town of Glendale. Once one of the Truckee Meadows most vibrant communities, Glendale has nearly faded away. Glendale traces its beginning to 1857, when a trading post was erected to serve emigrants crossing Nevada to reach California. 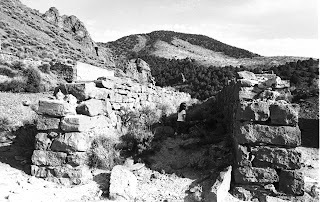 In 1860, a bridge was built over the Truckee River at Glendale and a small settlement formed. By the late 1860s, Glendale had a couple of stores, a blacksmith shop, several saloons, a small hotel, and a school. In 1868, Glendale residents thought that the Central Pacific Railroad might locate its main facilities in their hamlet. Their hopes were dashed, however, when the railroad’s surveyors showed up immediately after the Truckee had overflowed its banks and found water in many of the buildings. 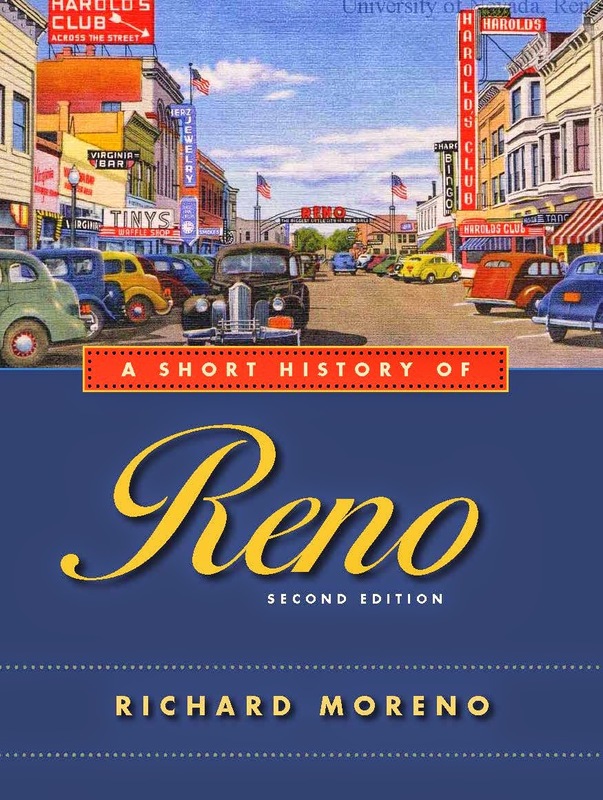 Instead, the railroad chose to establish the town of Reno as the site of its operations and by 1869 many of Glendale’s businesses relocated to the newer community. 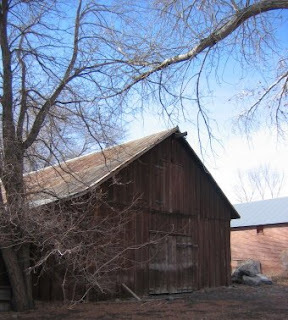 The two best preserved survivors of the town, which was located near the intersection of McCarran Boulevard and South Stanford Avenue in Sparks, are an old barn still standing on the town site (an historical marker near the barn notes the town’s location) and the Glendale School. The barn, still used, is a sturdy wooden structure with a rusted metal roof. The barn sits on private property so don’t trespass. The Glendale School was built in 1864. In the 1970s, the building was moved to the Reno-Sparks Convention Center site in South Reno. A few years ago, however, it was moved to the Victorian Square in Sparks. The school building is not only the oldest in the state, but is said to have the distinction of having been used as a school longer than any other in Nevada (until 1958). Its alumni include U.S. Senator Pat McCarran, once one of the state’s most powerful politicians. The school, which is open for tours (check with the Sparks Heritage Museum for times), is part of the Sparks Heritage Museum and Bicentennial Park complex at the east end of Victorian Square. The museum and park celebrate Sparks’ rich railroad history. Adjacent to the Glendale School is Locomotive No. 8, built in 1907 by the Baldwin Locomotive Works. The ten-wheeler was one of the last steam engines to operate on the Southern Pacific line and was retired in 1954. Attached to the engine are two historic Southern Pacific train cars, including a 1911 Pullman Car, said to have been used in 1948 by President Harry Truman on the successful whistle-stop campaign that helped get him reelected. The park also includes the original Sparks depot, now a visitors center, which blends nicely with downtown Sparks’ Victorian theme. The city has also adopted other Victorian-style touches, including a large outdoor gazebo and partially covered theater, street lamp fixtures, kiosks, fences and benches. The city of Sparks was established in 1905, following relocation of the Southern Pacific Railroad's main division point from Wadsworth to Sparks. The railroad rerouted its tracks along the eastern Truckee River corridor to eliminate several dangerous curves and grades. The railroad originally looked at Reno for its new shops, but went east because of cheaper land. A passenger station and freight yard opened in 1905. The town began to develop around the railroad’s facilities. Many railroad employees who had worked in Wadsworth were sold lots in the new community and moved their homes to Sparks. The new town was originally called “East Reno” for a short time, then “Harriman,” after E.H. Harriman, owner of the Southern Pacific Railroad. Finally, in April 1904, Harriman decided to name the community in honor of Nevada’s popular Governor John Sparks. For more information about Glendale, contact the Sparks Heritage Museum, 820 Victorian Avenue, Sparks, NV 89431, 775-355-1144.